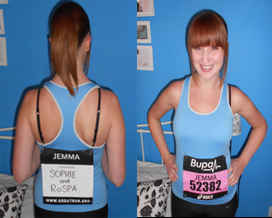 We would like to thank Jemma Kearsley who ran the Great North Run to raise money for RoSPA. She kindly agreed to write us a blog – please have a read. She’s a real inspiration, and we are extremely grateful to her. On Sunday 18th September at five past two in the afternoon I completed the Great North Run. I raised £670 (to date) for the Royal Society for the Prevention of Accidents. I am not a runner at heart but after watching the post event interviews a couple of years ago I was inspired to run in memory of my cousin and raise money for RoSPA. My cousin Sophie Underwood died tragically in a road traffic accident at the age of 18 in November 2007. She had been travelling as a passenger in a car when a series of unfortunate events led to the car bring involved in a three car collision. At Sophie’s funeral we decided to support RoSPA, a charity that works towards the prevention of accidents such as this. Over the last six months I trained for the half marathon, gradually extending the distances I ran. This started out well until 10 days before the race when I sustained an injury in my right calf and ankle. Luckily I managed to get a physio appointment and required a deep tissue massage which in itself was excruciating! Even after two sessions the physio was unsure if I would be able to complete the 13.1 miles. Jemma is ready to go! In the week leading up to the race I was very nervous and worried but just kept remembering who and what I was doing it for. On race day I made my way to the Central Motorway in Newcastle where the race was starting. There were over 54,000 competitors and thousands more spectators, the atmosphere was electric! I ran with my friend who was running to raise money for St Martin’s Children’s Hospice in Leeds. We set off and really enjoyed the first 5 miles, the crowds were cheering and the sun was shining. However, when we hit the 6 mile mark the heavens opened and my ankle really started to hurt. The next 4 miles towards South Shields were really difficult, but by the time we got to the last mile along the sea front the sun had come back, the Red Arrows flew overhead and the crowds were really encouraging. When I finally crossed the finish line I was extremely relieved and emotional. My family and friends were waiting to congratulate me and carry me home! Over the next few hours and days the run took its toll on my body. My legs seized up and my ankle was very painful but I had a huge sense of achievement. People have been so generous sponsoring me as they know how much both my family and I went through back in November 2007. Road safety is something I try to promote within my role as a Year 2 Primary School Teacher. We have road safety lessons termly and teach the children ways to stay safe in PSHCE lessons. I think the work RoSPA does is amazing and essential to prevent more families losing loved ones as we did our lovely Sophie. 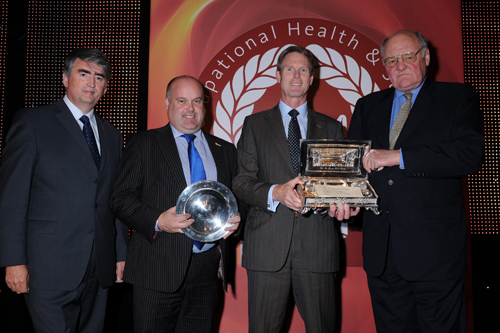 Last week saw the return of Scotland’s foremost health and safety event and awards ceremonies at the Hilton Glasgow. On September 21, the Scotland Occupational Safety and Health Forum opened with the theme “Finding opportunity amidst cuts and changes”. Tom Mullarkey, our chief executive, welcomed delegates and thanked the event sponsors, the Scottish Centre for Healthy Working Lives (SCHWL) before taking a look at health and safety in the current difficult economic conditions. First on the day’s agenda was a panel discussion looking at the day-to-day challenges faced by health and safety professionals. On the panel were Roger Bibbings MBE, occupational safety adviser for RoSPA; Fraser Allan, head of health, safety, environment and quality at CBES; and Tim Clarke, divisional managing director at Balfour Beatty Construction Scottish and Southern. What is important in health and safety leadership? Roger Bibbings said: “You have to do health and safety with people, not to them.” Worker involvement is key to success when it comes to safe and healthy working. Tim Clarke and Fraser Allan are great believers in engaging with employees, telling delegates that it’s not enough to lead from the boardroom – leaders have to get out there and find out what their workers are really doing and work with them to improve safety performance. Delegates at the event believe that health and safety has to be made exciting to get the message through to ground level – and they’re right! Health and safety does have the reputation of being rather grey and bureaucratic, which is unfortunate because it undermines the sterling work done by health and safety professionals. An interesting debate arose around the new RIDDOR proposals, with Roger concerned that seven-day reporting may be counterproductive; others believed that changes would not make much difference, in that those organisations which are “good” at health and safety will continue to be good, while those who are “bad” at it will be unaffected. Many good ideas were shared and discussed in the forum, with delegates getting involved and asking their own questions on a variety of subjects including leadership, communication, health and wellbeing, corporate manslaughter and the management of contractors. The forum also discussed the best way to present the business case for health and safety to senior management; something RoSPA has been talking about for some time now. Closing the event was a revealing – and brave – presentation by Ron Hunter of Scottish Power who provided an accident “autopsy”. He took a look at a real accident, examining the human and cost implications of the incident, as well as how the company investigated the incident, made improvements and moved forward. The film made by Scottish Power in the aftermath of this incident is publicly available in the hope that it will help other firms to avoid similar incidents. L-R: Tom Mullarkey, RoSPA's chief executive; Gregg Johnston, director of health, safety and the environment, Balfour Beatty Construction Scottish and Southern; Tim Clarke, divisional managing director (Scotland), Balfour Beatty Scottish and Southern; Lord Brougham and Vaux, RoSPA Vice-President. RoSPA’s awards scheme, the longest-running and most prestigious of its kind in the UK (and possibly the world!) took place on Thursday September 22, also at the Hilton Glasgow. Many award winners from Scottish businesses, who are rightly proud of their health and safety achievements, attended ceremonies in the daytime to collect their awards. In the evening, award winners attended a celebratory banquet for the presentation of the major awards. RoSPA’s highest accolade, the Sir George Earle Trophy, was this year won by Balfour Beatty Scottish and Southern Ltd., which also took home the RoSPA Scotland Trophy. Diners were entertained by Willie Young, who regaled the room with tall tales from his days as a football referee; and the band Ernest played until the small hours, with award winners dancing the night away. A good time was most definitely had by all! Gas Safety Week (September 12-18) is upon us, and well-timed it is too with the arrival of Autumn. Many of us will be thinking of turning on the central heating, and perhaps using the gas fire (or the real fire) for the first time since last winter. When it comes to gas appliances, it’s definitely better to be gas safe than sorry, and with this in mind the Gas Safe Register has put together its top ten tips for gas safety in the home. Anybody working with gas has to be Gas Safe Registered by law. To report someone working without registration, call Gas Safe Register on the free phone number 0800 408 5500. Don’t forget: carbon monoxide alarms are not a substitute for regular servicing and maintenance of gas appliances – they are a last line of defence. The RoSPA website has more advice and information on carbon monoxide poisoning. As disastrous as it can be, at one point or another you’re going to take your children on holiday. Though you hope for some relaxation and an afternoon beside the pool, reading a book and catching that perfect golden tan, time is often taken up building sand castle after sand castle, the complete crazy golf experience, the hunt to find the right factor sun screen (because you always forget something) and the worry of your children… well, being children. From experience I can tell you that us teens are often as worried as you are; who do I talk to? Where will I go? What shall I do? Will they like me? How do you say “Hi” in Portuguese? As a teen you stroll down to the resort’s pool, slapping on your most friendly and sociable face and remove your towel from around you with poise. You’re trying to remember that one foot in front of the other results in walking whilst attempting to maintain the fake cheerfulness that’s plastered across your face. Meanwhile, the wet pool edge is just too much for the clumsiness you’re trying to disguise, and in your rush you fall straight on your bum, all eyes on you. Embarrassing just isn’t the word. You were that awkward teen once, and you know what it’s like to be thrown in the deep end (sometimes literally). Trying to be careful in times like those is hard, especially when you’re attempting to up hold a positive first impression, but accidents happen, right? Falling on your backside is thankfully one of the least of your worries whilst visiting the pool, and parents can’t prevent us teens from stumbling across social hiccups, nor can they make them any less embarrassing. But, there are worse situations to encounter if you’re not fully aware of dangers by the pool and in the pool itself – that’s where you come in. You should always let teens know where they should be and the rules concerning the pool area. I often joke around with my best friend and we can be the most competitive of people (let’s face it I can swim much quicker than her) and being on holiday is no exception. Sometimes, this is how accidents occur. Showing off is more common in boys than girls, and it can be hard to distinguish a clear line where it should stop. 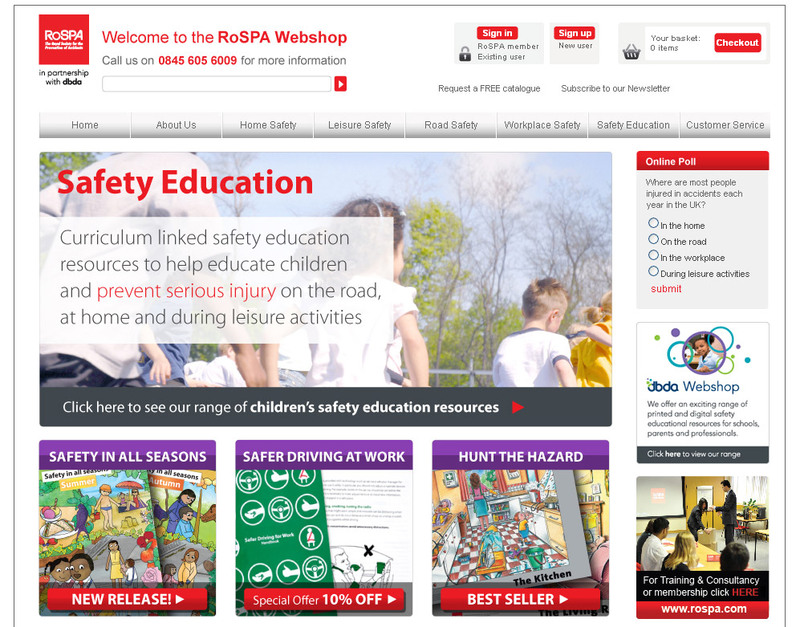 RoSPA offers loads of information on everything safety concerned, so if you’re unsure of what to tell your kids, log onto to the website and get smart on all things holiday, water sport and pool related. And yes, although we teenagers repeatedly claim we know best, it is best to let us know the difference between right and wrong, and tell us off when we’re running near the pool, because although we don’t seem like we are listening, you’re planting a seed in our minds so it can grow and we’ll think about it later. So, when we are about to run at the side of the pool we’ll also think back to that painful and embarrassing slip we had last year (wince) and never do it again. Everyone’s favourite (or not so favourite) pastime at the moment is finding ways to save money. From growing your own veg, to “making do and mending”, all things are considered in the drive to economise. However, there are hidden perils in the current desire to save money: when buying second-hand goods, do you really know what you’re getting? The recession, coupled with the rise of internet shopping, has presented new challenges to young consumers. The most obvious effect among young people is a growing dependence on second-hand goods. Pawn shops, charity shops, car boot sales and second hand retailers on and offline have thrived in the last few years as consumers (especially the young) choose to buy from them. Often young people see buying and selling second-hand goods as contributing to a good cause, or a form of recycling, helping to save the planet as well as their pocket. They are right, of course, and people should be encouraged to do so. However, our concern is that many second-hand goods are unsafe and there is no statutory “testing” that needs to be done before they can be sold. These are amongst the most popular products for young consumers to buy and sell, especially online via sites like eBay or Gumtree. Second-hand electrical equipment must be as safe as that purchased new from shops. Examples of appliances to which the regulations apply include hair dryers and straighteners, computers and computer game consoles and televisions as well as white goods. The biggest problem with electrical goods is “wear and tear”. By the time that they are sold second-hand these once-safe products are unsafe and the law does not expressly require an electrician to test the goods before they are re-sold (although this is best practice). And don’t forget that the instructions may be missing – and this is where the important safety information resides. Try checking the manufacturer’s website for information if you do purchase something without the packaging. Students and young people setting up their first independent home need to be aware that some second-hand furniture can be a fire risk. Second-hand upholstered furniture must comply with certain flammability requirements, and the only exception is for furniture made before 1950. All furniture meeting the requirements must be labelled, when new, with a permanent fire label – checks should be made for the labels, which are usually under the main cushion or on the base of the furniture. The problem with upholstered furniture is that many people cut out these permanent labels when they buy the furniture new because they think they spoil the look of the item. When the furniture is then resold second-hand there is no way of telling whether the unlabelled product is safe or not – again, the manufacturer’s website should be able to help. Young parents are under particular pressure economically and may well buy toys and other goods for their children second hand. The rule here is that toys should be as safe second hand as they are new. In general: they must not be flammable and should have no loose physical or mechanical parts, e.g. loose eyes or buttons, sharp edges or finger-trapping hazards. In addition they must contain no toxic substances or paint, be hygienic, and be marked with any appropriate instructions and warnings for use. A separate, but equally concerning area is counterfeit goods which are sold as brand new. Products posing particular risks to young people include counterfeit electrical chargers, toys and cosmetics, often found on markets and at car boot sales. Many have been found to be dangerously unsafe when tested. Of course, for young people with less money in their pocket products that have fallen off the back of a lorry can present a much more appealing alternative to second hand goods – they are cheap, but look exactly like the real thing. In the health arena counterfeit cigarettes and alcohol pose a serious problem for young people because they often contain dangerous levels of harmful chemicals. Young people often think that these are non-duty paid items (smuggled!) and welcome the opportunity to buy them (especially as the prices can be as low as half the price of the genuine products). The economic downturn and shift in focus away from product safety enforcement affects us all. It affects the young especially though, as they are more naïve about the risks posed by unsafe goods and when starting out in life there is often a compromise to be made between cost and quality. It is through these compromises that young people may be putting themselves at risk. Since data collection in this area has not been funded since 2002 it is very hard to quantify the true extent of this risk. People are not going to stop buying and selling second-hand goods, and nor should they. But buyers and sellers both have a responsibility to ensure that their goods are safe and fit for purpose. Saving money is all well and good; but an accident or serious injury will cost far more than is saved – in money and in pain. RoSPA’s partner in safety, dbda, has launched a shiny new website to showcase our range of products. Visit www.rospashop.com to take a look at what’s on offer. Resources cover a vast range of topics and safety areas, from workplace safety to safety at home, on the road, in and around water, and at leisure. Also on offer is an exceptional variety of safety education materials aimed at teachers and schools, as well as posters, books and activities for parents and governors. In fact, we’ve just released a new set of resources aimed at teachers – if you want to build safety into your lessons, your first stop should be RoSPA. Posters, books and videos are a great way of supplementing and illustrating safety messages, helping to bring safety to life. Go and visit, and take a look around: there’s something for everyone and plenty of ideas to inspire a safer way of life.